Really enjoyed my recent trip to San francisco. Our son, Michael, who lives there, married a Californian girl, Gretchen, on 28th December…a wonderful happy ocassion. There is a thriving art environment in San Francisco…so I always look forward to my visits. There is a wonderful artistic vibrancy..full of galleries and new ideas. My favourite and always first choice is the wonderful SFMOMA, which is full of treasures and always has some great shows on. 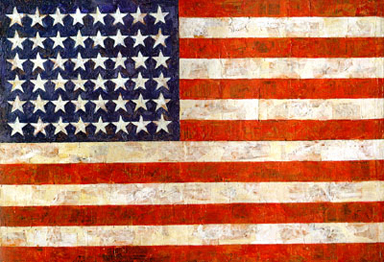 This time there was an amazing show featuring Jasper Johns… “Seeing with the Minds Eye”….. He’s 82 and still working. This show presents the full range of his career …from his rendering of numbers, flags and other motifs in the 50’s and 60’s to his exciting recent works. The show features 90 paintings, sculptures and prints and is a wonderful overview of Jasper John’s art. He shared a retrospective show of the late Jay de Feo’s work;, a local artist who was famous for her major work, “The Rose”‘ below, a large textured piece; almost sculptural, like a starburst, and very beautiful. It was also a great show. One could spend all one’s time enjoying art in San Francisco; but there was the wedding, shopping, trips shows etc!